My inspirations throughout the semester were my love for nature and the love I have for myself. I made my art the way I did because I felt like it was easier to express myself. It gave me a way to say what I couldn't say in words. I also felt like it gave people a better understanding of who I am. I used a variety of tools/materials, such as, graphite, acrylic paint, tempera paint, ink, paint brushes, straw, spray paint, cardboard, tissue paper, pipe cleaners, leaves, water bottles, paper cups, and soft pastels. To me my art is a way to express how I see society. For example my artwork of the beaches/island expresses tranquility. The beach brings a calm relaxed feeling especially at night. The artwork with my name and initials express the frustration i get when people spell and pronounce my name wrong. My most successful project this semester was " sailing through the night". To create this piece I gathered three different pictures and picked out something I liked about each one. Then I sketched out the image I had in my mind. Once I sketched out the image I transferred it to my final draft paper. Next I picked out colors that I saw best fit for my painting. I chose a lot of cool colors and tents. Once my picture was painted and dried I covered my whole painting in black ink. When i finished covering it in black ink I took the painting to the sink and washed off all the black ink. 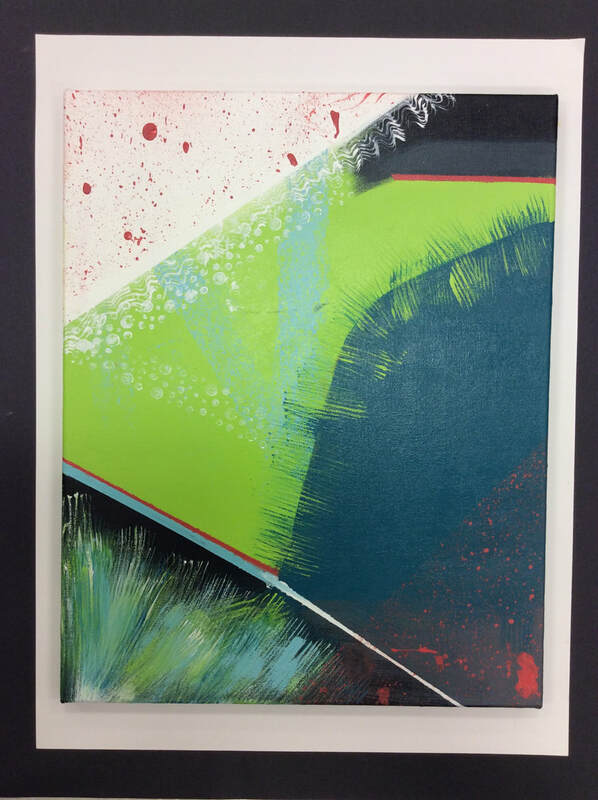 This project was successful for me because all the colors contrasted with each other perfectly. The image I had in my head was executed the way that I saw it. A project that I overcame obstacles in was "Flowers Galore". One obstacle I came across was the creation of the flowers. Originally I wanted to make the flowers out of construction paper. I kid you not that was a hard and stressful process. The flowers did not come out the way I wanted them to. Instead of using construction paper I went with a technique I already knew how to do. I used tissue paper to create my flowers. The second obstacle I came across was I didn't know how to make the vase for the flowers. The hardest part was getting the correct size vase for the flowers. I had made three vases before I got the right one. The next problem was figuring out how to decorate the vase. Then my teacher suggested I spray paint the vase and a classmate suggested I make splatters. 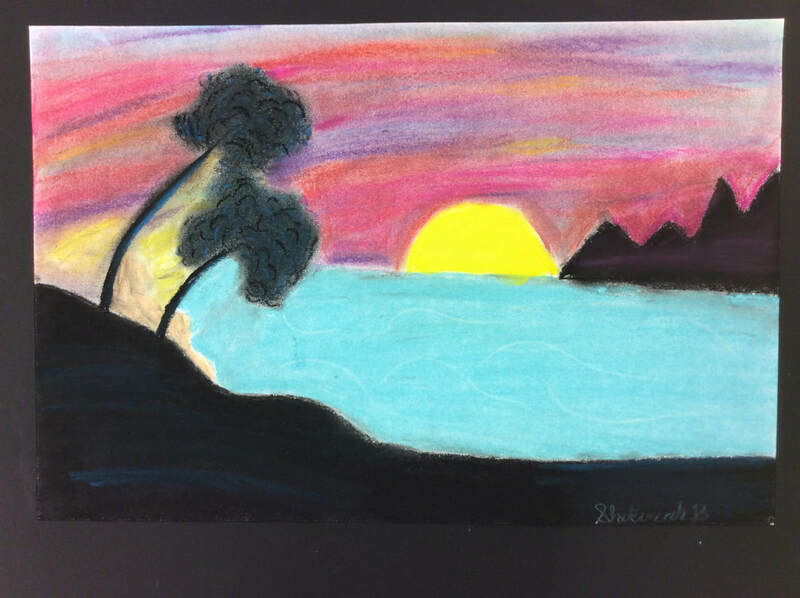 The media I enjoyed working with this semester is soft pastel. Although fun and easy to use it can be messy. If you don't like getting dirty I wouldn't recommend using this. Over all soft pastels blend very easily and makes the image come out very bright and vibrant. You blend the colors with your finger so when you go to use another color make sure you clean your hands. I liked it because I found the technique to be fun and easy. I loved the way my images came out. I like it because it gave my pieces a soft, smooth,calming vibe to it. My most successful print was soft-kut print. To do this print I took a soft-kut block and carved my name into it. (Have to carve the letters backwards and put the end of the word first). Then I put ink on the bench hook. Next I took the brayer and spread the ink out and rolled some ink onto the soft-kut. Following that i took a piece of paper and placed it on the soft-kut. Lastly I used my hand to spread the ink out and took the paper off. This print technique was successful for me because the image I wanted to create came out really clear. I used the right amount of ink. The print I would change if I could would be "Initials" To create this piece I had to put ink onto the bench hook. Then I used the brayer to spread the paint out. Next I used a wooden stick to carve my initials into the ink. (Have to carve the letters Backwards). After that I placed a piece of paper on the ink then I used the baren to make sure the ink and the design got onto the paper. The thing I would change about this print is the amount of ink I used and the carving material I used. A printing technique that I enjoyed working with the most was Screenprinting. To create this print I took a piece of paper and designed an image. Next I took the scissors and cut out my design. Once I had my design I taped the stencil to the back of the screen. Then i placed the screen on top of a piece of paper. Following that I put ink above the stencil and used something with a straight edge to drag the paint down to spread the paint out. Once the paint was where I wanted it I picked the screen up and I had my image. I liked this process because it actually allowed me to experience the process many people go through to make the shirts we wear. This art piece is titled "Flowers Galore". This piece was inspired by my love for flowers. The creation process required some trial and error. At first i wanted to make the flowers out of construction paper but that was harder than it seemed. I'm glad I tried to go outside my comfort zone. I might try it again. I decided to stick with something I know how to do and that was to create the flowers from tissue paper and pipe cleaners. My next step was to create the vase. That was the easy part. After I had everything together I had to take a step back and decide on how I wanted to decorate the vase. I got some help from Ms.Schumann and my peers. We came up with a black base color and splatter of the colors seen in the flower. This art piece came out way better than I imagined. I am extremely proud of this art piece. This piece is called "Leafing out of Fall". This idea came to me as I was walking outside in my backyard. To create this art piece I pulled some colored leaves off of the tree in my backyard. Then I went inside my house to get a water bottle. Next i decided to put the leaves inside the bottle like a vase of flowers. The end product looked very plain to me, so I decided to use my brother's baseballs to create a circle around the water bottle. That wasn't enough for me. 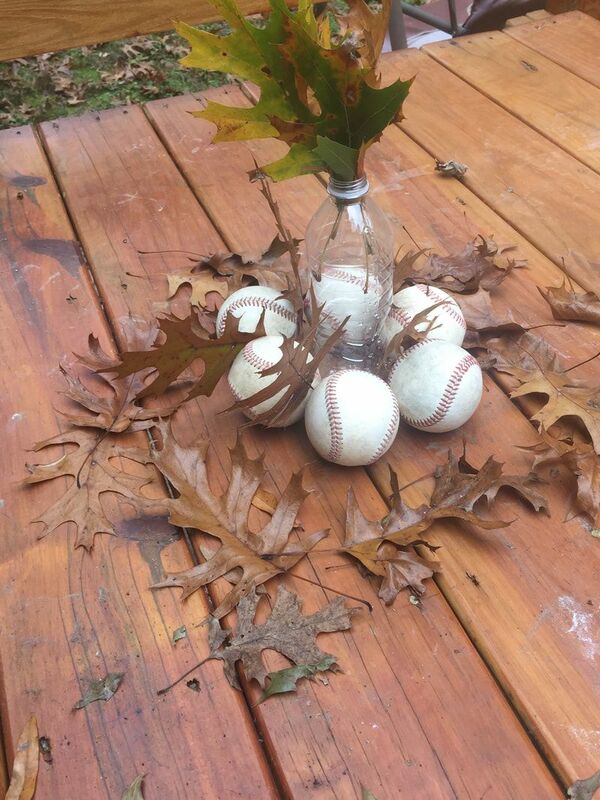 Finally I decided to add the leaves that turned brown around the baseballs to create the idea of the seasons changing. Hence the title "Leafing out of Fall". A challenge I came across during my creation process is I couldn't get the leaves to stand up in between the baseballs. It took me a couple tries and a few adjustments to get the leaves to sit the way I wanted them to. It was also a struggle to keep the baseballs from rolling away. At one point the water bottle had fell over and all the leaves fell out. In the end I got the image I was looking for. 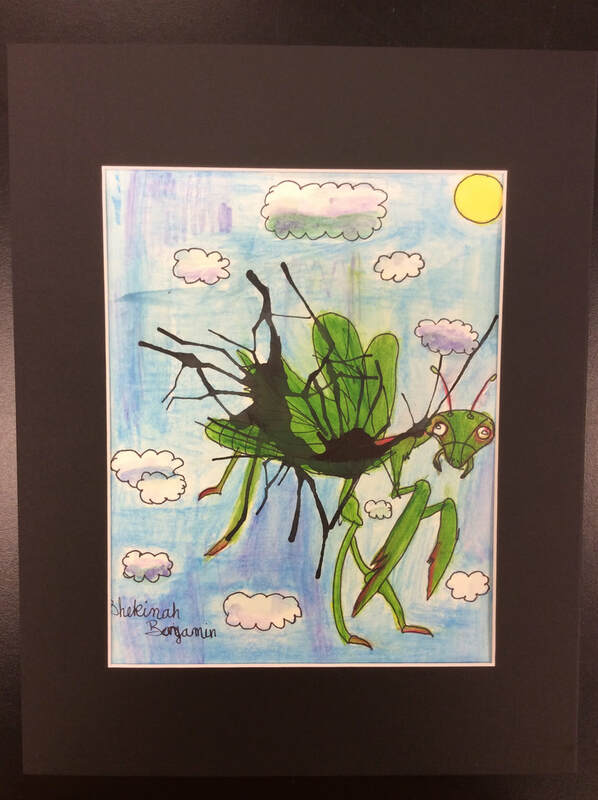 The title of this piece is "Gregory Grasshopper". This piece looks like a the face of a grasshopper. 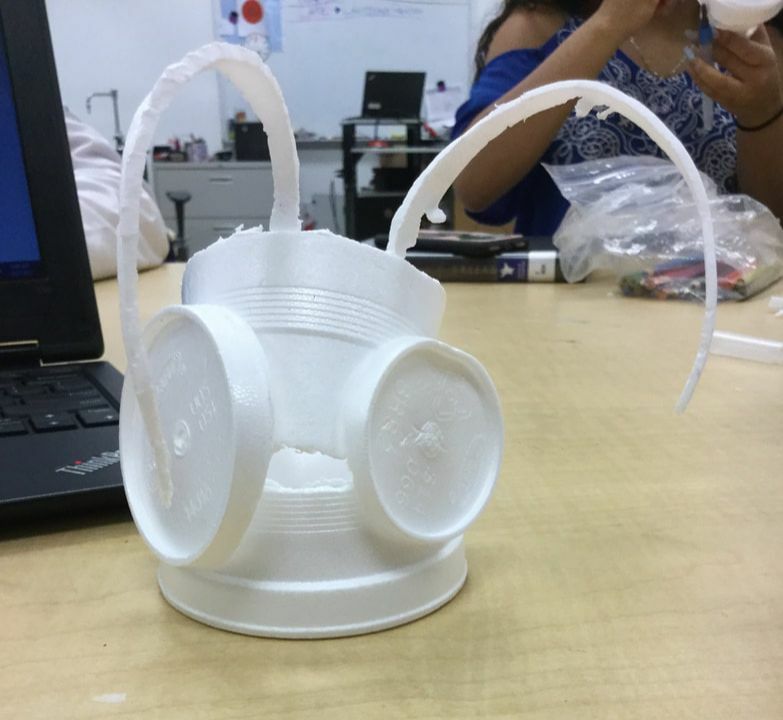 To create this art piece I took two styrofoam cups and I cut the bottom of the cups out. Then I cut the rim of one of the cups to make antennas. Next I cut the top of the big cup and made it the bottom half of the face. Finally I cut the top and bottom of the small cup to make the top half of the face. This final piece is not at all what I imagined. I had something totally different in mind when I was creating this piece. I was going for a much more abstract look but it didn't work out so well. The next thing I envisioned was a canon that they used in the wars. When I turned it around it started to look like a cartoon grasshopper so it inspired me to add antennas. This piece was inspired by my original art piece "Initials". To create this original piece we took our view finder and cropped a section of the art piece. Once we picked a section we liked we took a picture. Once we had the picture we printed off a gray scale image to find the right shades, tents, and colors for our piece. My collaborative creative experience was very different from any collaborative project I did. Everybody in the group contributed ideas. There wasn't any big disputes about what to do and where to put things. Everybody considered the ideas of each other. I learned a new technique, which was splattering with a toothbrush. In order to splatter with a toothbrush you must add water to your paint to get it half watery. It almost looks like putty. Once it's watered down you put some paint in the toothbrush and drag your finger across the brush to flick paint onto the canvas. A challenge we kept coming across in our creation process was we kept getting colors in the wrong places or we would use the wrong color by accident. To fix these problems we dried the paint or let the paint dry on it's own. Then we would go back and paint over the spot with the color we intended for it to be. I helped others through their art experience during this project. I did this by leaving constructive feedback on their project. What I mean by constructive feedback is I told them what I liked about their project. As well as suggested things they can add and improve on. In the first still life ends were cut off. The image didn't meet the Rule of Thirds. In the second still life you can see all the edges. You can also see where the rule of thirds are located. In the first Landscape you can see a lot of the ground. The horizon isn't present. In the second Landscape image in the horizon is easy to find. You can also see a proportional amount of ground to sky. In the first portrait the picture had a glare to it and the face was blocked out a little. In the second image the face is more clear. There isn't a glare. This art piece is called "Sunset on the Isle". The media used to create this art piece was soft pastels. To create this piece I wrote down things that came to mind when I hear or see the word Naturescape. After I wrote down the words I drew/sketched images of what I wanted to create. Next I did two rough drafts. I finally I recreated the piece that I was most confident in. goo.gl/images/JPUM3Q inspired this art piece. My goal as an artist is to connect to the feelings of others through my artwork. The art piece connects to the feeling of peace or being at ease. The final piece came out greater than what I imagined. In the since of the colors blended very well together. The title of this piece is “Praying Mantis’ Spread Wings too”. The subject matter of my artwork is the praying mantis. To create this piece black ink was placed on my paper. Then I used a straw to spread the ink out by blowing into the straw. Next I looked at the ink to determine what I saw. This piece expresses the idea that everyone appears differently; but have similar characteristics. In creating this artwork I learned how to create an image from a blob of ink. The final piece is what I imagined. The way this piece will help me in the future is I will try to create different pieces by starting with a blob of ink and figure out the different images I see. I am a student at vmcca in the Nurse Aid program. I am currently a junior. I am also an art student.